The Russian host—who’s done some other highly questionable things to cars like install wooden pistons and fill the crank-case with Coke—picked up 10,000 self-tapping screws, and zipped them through four tires’ tread areas with a cordless screwdriver. By his calculations, each tire needed about 1,800 screws, all of which protruded about 0.4-inches once they were installed. 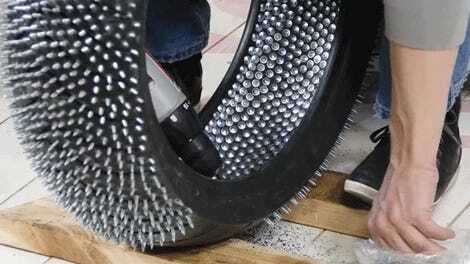 Since tires with a bunch of screws in them don’t hold air, the host uses a tire tube and some duct tape against the screws’ heads to keep the tube from pushing directly against them. From there, he mounts the tire and pumps up the tubes, which then push against the duct tape on the inside of the tire, holding the screws in position. This idea of homemade studded tires isn’t new. I saw a bunch of screws popping out of tires at Speed Weekend on Ice in Sweden back in March, and we’ve even written about some Russians do this very thing on motorcycle tires. And actually, this practice is rather popular in the grassroots rally community, with “butyl” windshield sealant as an apparently popular way to keep air from leaking past bolts. Either way, it seems sketchy. Anytime someone “modifies” their vehicle without running at least back-of-napkin calculations how how the modification will affect the component’s strength/failure modes worries me, especially when that component is as important as a tire.